Prevention • Deer, moose, elk on two ranches to be killed to undermine spread. ( Utah Division of Wildlife Resources photo) An elk in Utah Leslie McFarlane, a Utah Division of Widlife disease specialist wrestles a good-sized buck into place to make an incision in its neck to remove the lymphglands. The glands are then sent to a lab and tested for chronic wasting disease. This took place at a deer check station near Mountain Green along I-84 near Ogden. There were several other checkpoints around the state checking deer for the disease. Hartmann/photo 10/21/06 Utah Department of Agriculture officials confirmed Friday that a bull elk shot on a private hunting park in northern Utah has tested for the fatal neurological malady known as Chronic Wasting Disease. More than 20 wild deer and two moose stuck in the Broadmouth Canyon hunting park will be killed and tested for CWD. More than 60 elk on a breeding ranch near Blanding will also be killed. Utah Division of Wildlife Resourceswildlife technician Vern Shepardson attempts to place a blindfold on a trapped buck while Leslie McFarlane (left), a wildlife disease specialist assists. McFarlane is conducting research in the La Sal Mountains near Moab that she hopes will shed light on migration patterns of the deer and the ways that chronic wasting disease is transmitted. Mule deer in the La Sals have shown the highest frequency of chronic wasting disease in the state. Photo by Lisa Church Utah Department of Agriculture officials confirmed Friday that a bull elk shot on a private hunting park in northern Utah has tested for the fatal neurological malady known as Chronic Wasting Disease. More than 20 wild deer and two moose stuck in the Broadmouth Canyon hunting park will be killed and tested for CWD. More than 60 elk on a breeding ranch near Blanding will also be killed. 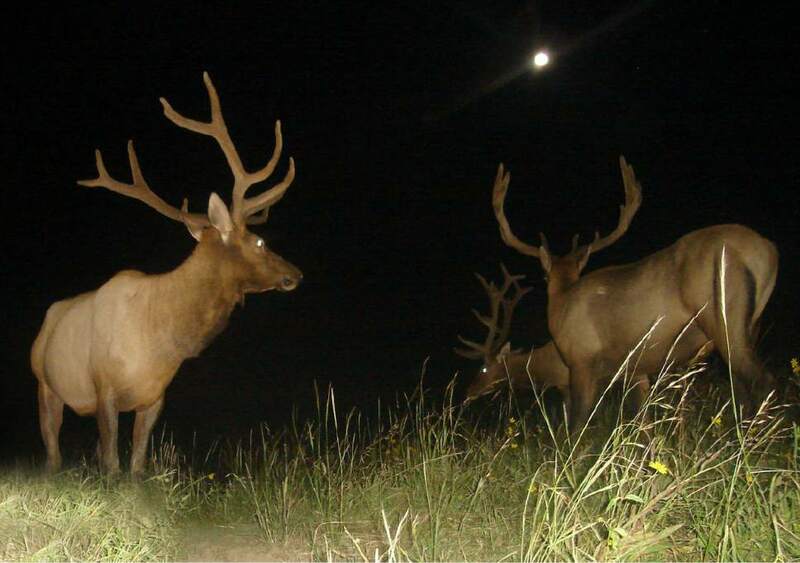 Utah Division of Wildlife Resources | These big bull elk were caught on a trail camera in the central part of Utah. Utah Department of Agriculture officials confirmed Friday that a bull elk shot on a private hunting park in northern Utah has tested for the fatal neurological malady known as Chronic Wasting Disease. More than 20 wild deer and two moose stuck in the Broadmouth Canyon hunting park will be killed and tested for CWD. 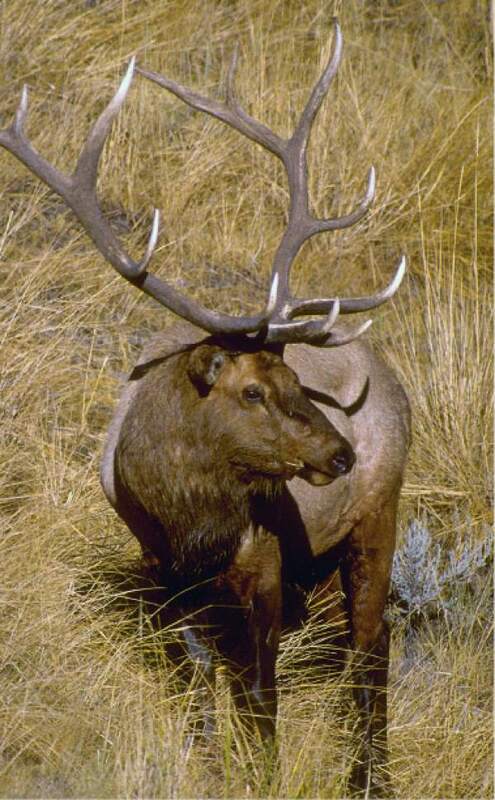 More than 60 elk on a breeding ranch near Blanding will also be killed. 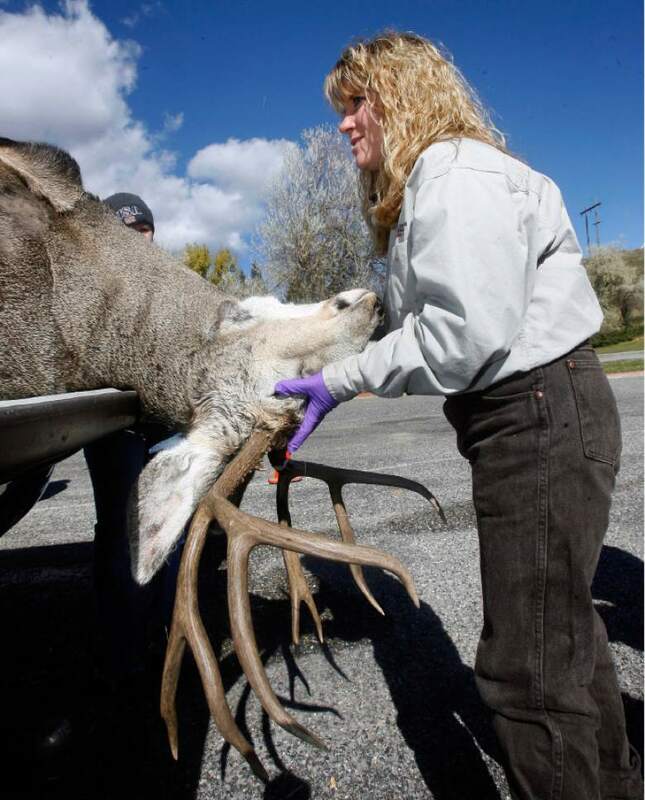 Leslie McFarlane, a Utah Division of Widlife disease specialist wrestles a good-sized buck into place to make an incision in its neck to remove the lymphglands. The glands are then sent to a lab and tested for chronic wasting disease. 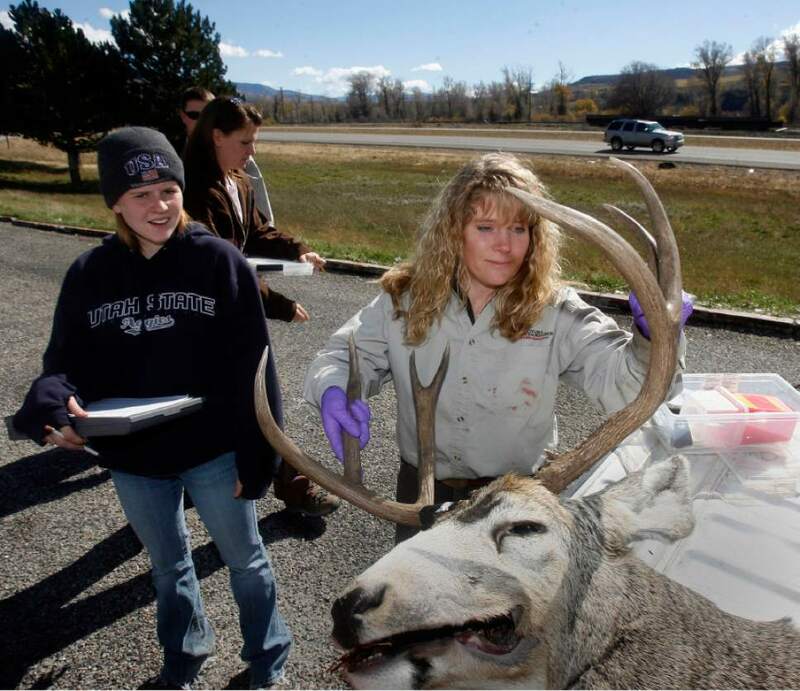 USU wildlife science undergraduate Clarissa Richins , left, takes notes. This took place at a deer check station near Mountain Green along I-84 near Ogden. There were several other checkpoints around the state checking deer for the disease. Hartmann/photo 10/21/06 Utah Department of Agriculture officials confirmed Friday that a bull elk shot on a private hunting park in northern Utah has tested for the fatal neurological malady known as Chronic Wasting Disease. More than 20 wild deer and two moose stuck in the Broadmouth Canyon hunting park will be killed and tested for CWD. More than 60 elk on a breeding ranch near Blanding will also be killed. 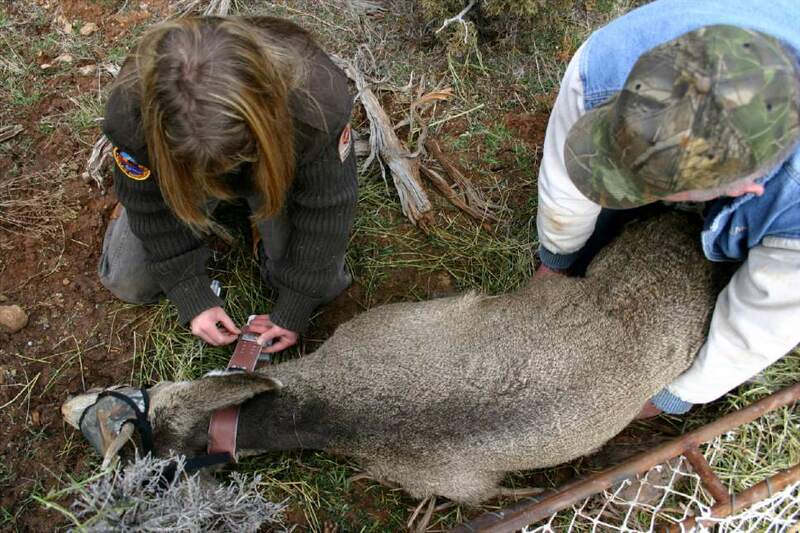 Leslie McFarlane (left), a wildlife disease specialist with the Utah Division of Wildlife Resources, puts a radio collar on a 1 1/2-year old buck mule deer whild wildlife technician Vern Shepardson restrains the buck. McFarlane is conducting research in the La Sal Mountains near Moab that she hopes will shed light on migration patterns of the deer and the ways that chronic wasting disease is transmitted. Mule deer in the La Sals have shown the highest frequency of chronic wasting disease in the state. Photo by Lisa Church Utah Department of Agriculture officials confirmed Friday that a bull elk shot on a private hunting park in northern Utah has tested for the fatal neurological malady known as Chronic Wasting Disease. More than 20 wild deer and two moose stuck in the Broadmouth Canyon hunting park will be killed and tested for CWD. More than 60 elk on a breeding ranch near Blanding will also be killed. A bull elk shot in a private northern Utah hunting park has tested positive for chronic wasting disease (CWD), Utah Department of Agriculture officials confirmed to the Salt Lake Tribune Friday. Confirmation of the neurological disease&apos;s presence means the approximately 20 wild deer and two moose fenced in on the Broadmouth Canyon Ranch in Liberty will have to be killed to be tested. The entire herd of elk  more than 60 animals  at the Howe&apos;s Elk Ranching operation near Blanding, where the CWD-positive bull came from, will also have to be destroyed and tested. "The bull came from the farm in southeastern Utah as part of a group of 11 bulls," said Utah state veterinarian Warren Hess. Hunters at the Broadmouth Canyon Ranch killed nine of the bulls, and tests on one of them came back positive, he said. As a result, ranch owners killed the last two bull elk. "We are waiting for the results on those animals," Hess said. Hess said Howe&apos;s Elk Ranch is under quarantine while the state works with the U.S. Department of Agriculture to seek compensation for the elk. The CWD-infected bull had been at the Liberty hunting park for less than three weeks when it was killed. The state mandates testing of all animals killed at private elk farms or hunting parks, and the bull&apos;s results came back positive just before Christmas. "There wasn&apos;t a long exposure and so far that is the only animal to test positive," Hess said. "We have two areas of concern: the park itself and the deer inside the park and the chance of them being infected and getting back out." It is unknown where the elk at Howe&apos;s Elk Ranch picked up CWD. Hess said records show there has been no movement of elk into the the Blanding ranch for the past five years. Utah Division of Wildlife Resources (DWR) officials are making plans to hunt the deer and moose in the Broadmouth Canyon Ranch enclosure to test for CWD and to prevent them from escaping and reaching other wild animals. "We will work with the Department of Agriculture to minimize the risk of contact between domestic and wild animals," said DWR&apos;s mammals coordinator Leslie McFarlane, who oversees the state&apos;s wildlife disease program. Chronic wasting disease is not new to Utah wildlife. The disease is sometimes compared to mad cow disease, but is not deemed to be transmittable to humans. It first showed up in Utah in 2002 when a buck mule deer killed during the rifle hunt near Vernal tested positive. A doe mule deer found dead in a field near Moab in 2003 was the second known case of CWD in Utah. Since then, according to McFarlane, there have 62 cases of CWD in Utah. Two elk have been confirmed to have CWD. A map showing the distribution of CWD in Utah between 2003 and 2013 shows no evidence of the malady near Liberty where the Broadmouth Canyon hunting park is located. DWR biologists conduct annual CWD testing in areas where it is prevalent and at random locations across the state to monitor Utah&apos;s herds. "We will increase our monitoring around the two facilities by looking at live animals that appear sick and doing tests on road kill," McFarlane said. "If people see sick animals we would ask that they let us know." Hess said operators at both elk facilities have been working with the Department of Agriculture to address the issue. Broadmouth Canyon Ranch is owned by the family of former Utah State University football player and National Football League All-Pro Rulon Jones. The state has had issues with fence breaches at Broadmouth Canyon in the past. The family also operates an elk hunting ranch in Idaho and two hunting ranches in Mexico. Hess said the department is not aware of any movement of elk from the Utah ranch to the Idaho ranch, which is in the Blackfoot Mountains.